Winter is here! 🙂 Time to bake more and devour with family and friends, this is the best season to enjoy food in any form. 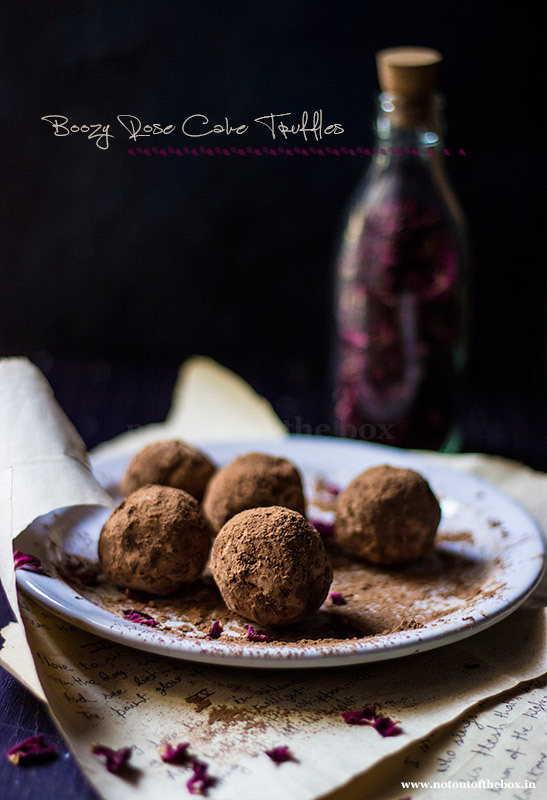 Being a person with sweet tooth I always try new things for my family and these Boozy Rose Cake Truffles are our new love. They are fancy and have the perfect booze from Rum. These are complex with so many flavours, Rose+Chocolate+Rum you can imagine the taste, if not make, indulge and enjoy! Line a tray/plate with aluminium foil or baking paper. Keep aside. Bake the cake according to the recipe; let the cake be cooled completely. Break the cake into small pieces. Grind using a mixer/grinder, or else you can simply crumb the cake by using your fingers. 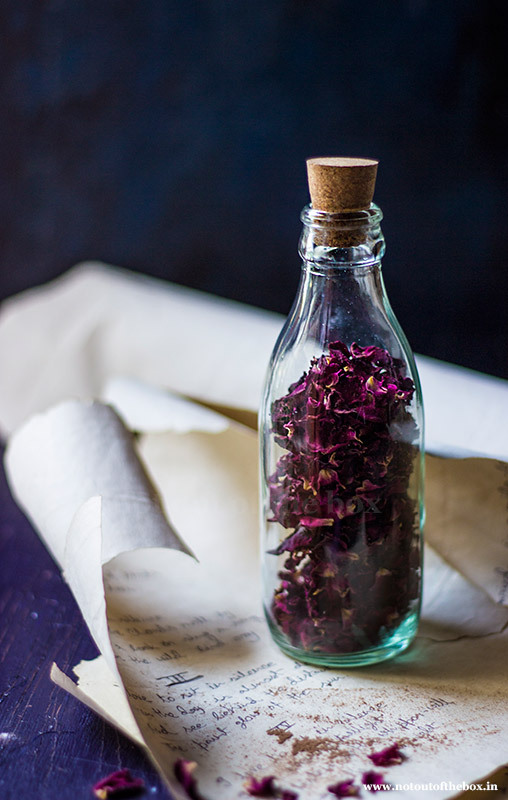 Transfer the cake crumbs into a bowl; add rum, rose water, dry rose petals, dry fruits and melted dark chocolate (read note). Mix well using your fingers and start making lemon sized balls from this mixture. 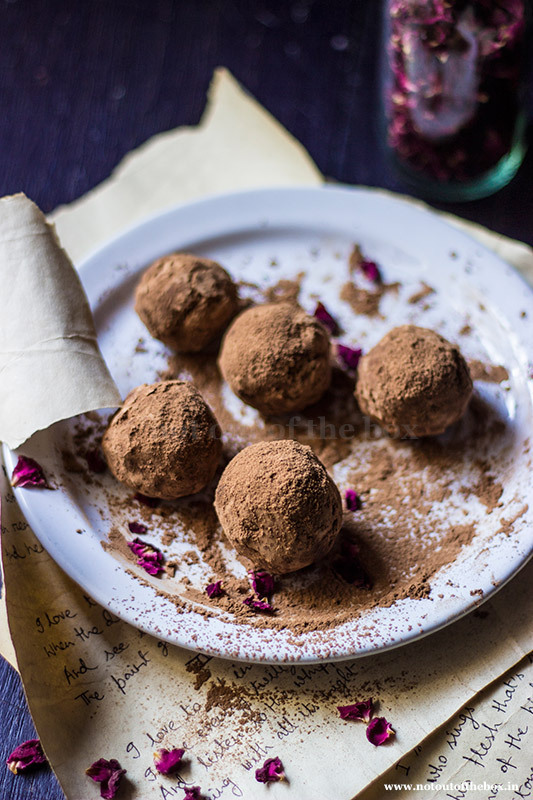 Spread cocoa powder on a plate, roll the truffles on cocoa powder and transfer them on to the paper lined tray. Keep refrigerated for 30 minutes or until firm. To melt the chocolate break them into pieces and use a double boiler (to know double boiler method check this) or microwave the chocolate in an oven proof bowl on 60% power. If using microwave for melting, stop and stir after every 30 seconds, it should take 1-2 minutes to melt the chocolate completely. Store them in an air tight container, keep refrigerated. Welcome! This is Chandrima, the mind behind Not Out of the Box (NOB) a Food and Recipes blogsite. Being a trained Visual Designer I need Food for my Thoughts :) and NOB is the reflection of that. Visit Not Out of the Box's profile on Pinterest.